I’ve heard all these arguments many times, so I found it especially interesting when this subject came up last year in a beekeeping class. The class had a large number of extremely experienced beekeepers, and among that group were people who added a qualifier to all these standard answers: usually. Most often lots of pollen is a good thing, but on occasion an excess of pollen can signal queenlessness or a soon-to-fail queen. Another beekeeper explained that when he sees frames with solid expanses of pollen shrinking the brood nest he becomes suspicious of queenlessness. It seems that even though the need for pollen has decreased, the rate of collection remains the same, and the combs soon become filled with pollen in excess of normal. Personally, I’ve only seen this a few times, but I don’t keep hundreds or thousands of hives like some of the others. Still, in the instances I recall, the colonies had normal egg-shaped brood nests surrounded by arcs of pollen. But later inspections revealed these colonies had begun backfilling the nest with pollen until there were literally no cells for the queen to use. The first time I noticed this I went into the brood box with the intention of removing some of the pollen to keep for later, but it was too late. The queen was gone and the colony was crashing. Oddly, from the outside everything looked normal: bees were coming and going carrying great loads of colorful pollen. Nothing seemed amiss. Since the class ended, I’ve been trying to learn more about this phenomenon. Several commercial beekeepers have mentioned that the presence of massive amounts of pollen serves as a warning that the colony should be checked further. It may mean nothing—an excess of pollen may result from a genetic propensity to collect more than average. On the other hand, too much pollen could mean a failing queen. A quick inspection of the brood nest will tell the beekeeper if he can ignore it or not. I still haven’t found an explanation for the excess pollen. I don’t know why the bees keep collecting even though the need is steadily decreasing. Still, I like the solution outlined above and recommend it as a management technique: If you see too much pollen, check the queen and replace her if necessary. If the queen looks good, don’t worry about the pollen and let the bees do their thing in peace. Frame of pollen. If you think you are seeing too much pollen, check for the presence of a queen. Photo courtesy Bill Hesbach. Pollen over collection and plugging up is very very common in Hawaii where there are year round sources of both nectar and pollen. We have to take out frames filled with pollen regularly or they indeed run out of space for brood rearing. Thanks for posting on this! I have been wondering about what to think when I’ve seen an abnormal amount of pollen, especially when it’s not in the normal pattern around the brood. Last fall we had a colony with this and it did not make it over the winter. Now I know what to assess for if I see this situation again. I believe pollen collection is stimulated by enthusiastic retrieval and the protein content of the feed given to foragers by the nurse bees. I wonder if decreasing number of nurse bees with a failing queen are giving misguided queue to the foragers. Maybe older nurses are not producing a well balance royal jelly? Maybe if they have not brood to take care of, they willingly retrieve pollen from foragers. I have seen this quite a bit in the past 2-3 years in San Francisco where we have something blooming late Dec-late Oct. However, the pollen plugged frames are usually in the bottom 2 boxes of the hive. The bees seem to keep this pollen in reserve below the brood nest while still storing excess honey overhead (and some in these pollen-plugged frames as well), leaving little room for brood rearing which takes place primarily higher up. Interestingly, some of these pollen-plugged frames get emptied out from time-to-time, primarily from the middle frames. I use 1 deep with all additional boxes being mediums for all colonies and no queen excluder. I recently resumed use of slatted racks to see if this might change the bees’ use of frames in these bottom boxes. Thanks, Rich. I am eternally grateful to the grammar police! Like most beekeepers, I love watching the entrances to my hives. They’ve been bringing in tons of pollen (we finally had some fair weather for the bees after a brutally cold and windy winter). However, I don’t assume, as other beekeepers do, that the pollen means there is brood. I’ve read a lot and watched many documentaries, I haven’t learned that the presence of brood stimulates pollen collection. If there is a reference for this, I would gladly read it. I say this because when a kindly beekeeper was making a nuc for me as a gift (my first bees! ), the former beekeeper who kept the nuc on her property because of known DCAs said all looked well because they were bringing in pollen. She assumed there must be brood. She never checked and the beekeeper who made the nuc didn’t check. Actually, he’d never been able to see eggs so making nucs was always a gamble for him–if I had only known! When we brought the nuc to my house, the minute we opened it, I know it was queenless. There were maybe a few hundred bees, if that. But they had pollen and they had nectar. I think many beekeepers forget the basics when facing a situation: bees collect pollen and nectar, it’s what they’re born to do. So faced with no brood to rear, even hopelessly queenless colonies will collect nectar and pollen. Sorry for the long comment, but I tell this to every new beekeeper who tells me everything looks good because they’re bringing in pollen. Never assume. Also. Last year they filled every spot with nectar and that left little space for the queen to lay. Why does this happen to my two hives? Backfilling the brood nest with honey is usually a sign of an impending swarm. Pollen bound frames happens here. These are from our region being nectar poor but pollen rich and foragers won’t normally come home empty, and why our summer dearth becomes a propolis bonanza!!! I take these pollen bound frames and move them up into the honey chamber for topping off then in fall move those frames into the the summer splits. This is what I call rocket fuel for the overwintering nucs…come spring this bee bread gives warming colonies the fuel they need to rear big populations early, course it keeps me on my toes to make sure they have enough honey to not starve in late February and all of March. So, this is happening in my hive! It lost it’s queen sometime in autumn, the bees raised an emergency queen. She was successful until late winter maybe even too successful because they prepared to swarm and did…twice! The inspection of the hive after the 2 swarms left was a bucket of cold water. I didn’t think about what to expect and I didn’t expect frames and frames of no egg or larvae whatsoever and only a few drone capped cells and 2 queen cells still unopened. For the next couple of weeks the still large worker population has been collecting lots and lots of pollen and storing it all over the frames. But on today’s inspection I did find larvae and – my first time – I saw the queen! (that was exciting!) She is beautiful, very dark and hairless, very long abdomen. I confess she doesn’t look very young to me, as her abdomen looked so smooth and dark, not hairy as I assumed it would be if she was young. But I can’t see how she could be older that a 2 to 3 weeks, when the swarms left the colony. I assume the extra pollen will now start to be consumed and the frames liberated? Or would you advise me to substitute a couple of frames heavy with stored pollen with new clean frames? Thanks, you seem to post things that are happening to my bees all the time, it’s great. It wouldn’t hurt to give her some new frames so she has plenty of space to lay. Keep the frames and you can return them later in the year. In February I realized one hive had a problem with varroa mites, so I decided to use the sugar dusting at this point in the season (So Cal, good nectar flow) to keep their numbers down. As a result, I’ve been checking and dusting weekly. Yesterday I found more pollen than I had expected (much more!). As a result of your post I looked a little closer and I seem to have a queen issue (not much new brood, new queen cells). So I’ll requeen soon (2 weeks) and hopefully that hive will be stable and happily productive. Thanks again, both to you and to Randy Oliver (my two choices for late night reading). Rusty, you mentioned that you were going to remove pollen, but it was too late. So please tell me, how do you remove the pollen? I’m a 3 yr newbee! I fear I mislead you. I only meant that I would take some frames of pollen out of the hive and store them (in the freezer). How to get the pollen out of the little holes? I have no clue. My hive is healthy and well, just swarmed two months ago, is now requeened and has pollen, capped brood, and honey is only one deep though. Just wondering if this all sounds go to you. What would the ‘normal’ range of pollen be (ie how many frames?) in a 5 box hive? They are not honey bees. They are some kind of solitary cavity nesting bee, perhaps mason bees or leafcutters. What you describe is exactly what they do. 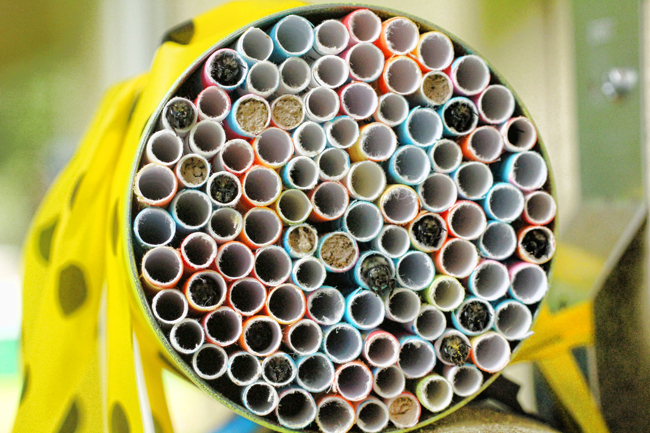 Here is a photo of mason bee housing that you can build.